The baby sister of Toni Gonzaga will finally make her dream come true this coming April 25, 2015. The dream Alex Gonzaga has long been asking for is to have a concert of her own at the 'Big Dome' - Smart Araneta Coliseum just like her big sister. Eventhough she've been hesitant at first, she still believe that she deserve the upcoming solo concert. Asked by Ms. Kris Aquino if she's nervous or worried on her upcoming event, Alex confidently said, "Tuwing nagpe-pray ako, parang parating may nagpapa-calm sa akin na ‘Don’t worry. Don’t think about it. It’s my job. Do your thing.'" 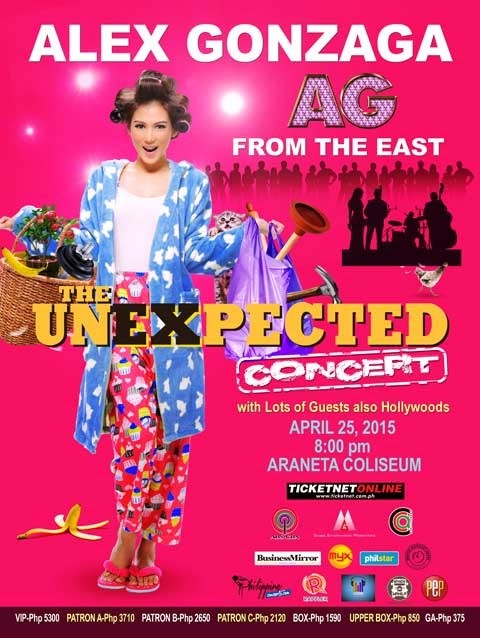 Comments or suggestions about "AG From the East: The Unexpected Concert on April 2015" is important to us, you may share it by using the comment box below.